If you want to download these recipes in pdf format to be used on your kindle, Smartphone, PC or Tablet for easy reference just click here to fill out the form. Food Dehydrators are very versatile machines that can be used to make a wide variety of food items. We have compiled a list of 20 delicious recipes from Breads and breakfast bars to snacks and desserts.. This may be one of the best types of toast you have ever tasted. Unless you happen to have a few of these ingredients on hand and ready to use, the entire process might be a be a bit time consuming, however you will find the results are well worth the time and effort. With a little experimentation, there is no end to the number of toppings that can be added to make tasty treats for everyone in your family. InstructionsStart by soaking the almonds for 4 to 8 hours, then drain and rinse them. These should be placed in a food processor and chopped into small pieces, do not grind them until they are too small. Now add the almond and veggie pulps, salt, garlic, and flax seeds. Process this mix only to the point at which it is combined and then add the carrot juice. Add 1/2 cup of the carrot juice at first, and only add as much as is needed to create a batter that is similar in consistency to bread dough. It needs to be dry enough that you can shape it into a log. Your dough mixture must not be soupy or runny in any way. At the same time, it must be wet enough that it will stick together. Prepare 1 or 2 dehydrator trays by lining them with mesh sheets. Shape the dough into a log that is approximately 3 inches wide by 2 inches tall. The best way to do this is on a cutting board. Simply turn the dough out onto the cutting board and use the palms of your hand to shape it into a log. Cut the log into slices that are approximately 1/2 inch thick. Place these slices on the dehydrator trays. Set your dehydrator to 145 degrees Fahrenheit and let it run for 1 hour. Reduce the temperature to 115 degrees Fahrenheit and allow it to run until your almond toast slices are crisp and there is no remaining moisture. The toast can be stored for up to 2 weeks in an airtight container. Wraps make an amazing staple food to keep handy in the kitchen. They can be easily stored in the refrigerator packed in Zip-lock bags. Should they become hard or brittle to the point of not being able to use them as wrap, all you need to do is dampen them with a small amount of water or steam them for a few seconds in the microwave. The best part is you can fill these wraps with a variety of your favorite veggies, creating a healthy, tasty meal for your whole family. InstructionsUsing a blender on high speed, combine and blend all ingredients (except the ground flax seeds) along with just enough water to cover them. Continue blending until the mixture develops a smooth texture. Pour this mixture into a large mixing bowl and add the ground flax seeds. Mix until the content of the bowl becomes creamy. Cover your dehydrator trays with Teflex sheets and pour the batter over the sheets. Spread the batter out to make the wraps as thick or thin as you like. If you spread it out to the edges of the tray, you can make your own tortilla chips. A little thicker and you have tortillas, and finally once you have mastered controlling the thickness, you will have great sandwich wraps. 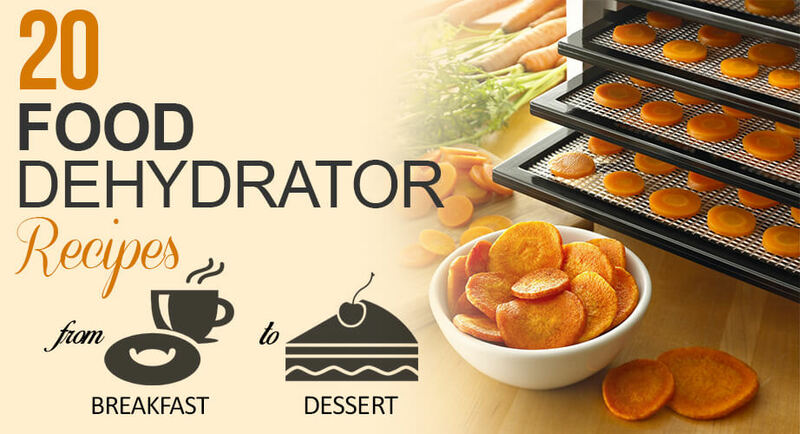 Set the temperature on your dehydrator to 105 degrees Fahrenheit and set to run for 4 hours. At this point flip the wraps over on the trays and remove the Teflex sheets. Set the timer for another 3 hours and keep an eye on the bread. Your wraps should be removed once they lift off of the trays easily and are still nice and moist. These wraps can be placed in Zip-lock bags and kept in the refrigerator for several weeks. Looking for an easy recipe for something special for breakfast, brunch, or to serve as a dessert? This recipe has a lot of great ingredients that not only impart a great deal of flavor to the finished product they are also super healthy for you. You can experiment with the flours you use, substituting coconut or spelt flour in the recipe, or you can grind your own almonds in a coffee grinder, blender, or food processor. If the dough is a bit too thick, add a bit more water, consistency should allow the spoonfuls of dough to hold their shape. Instructions:Soak flax seed for one hour in 1 cup of water. Place in blender and blend until smooth. Transfer flax seed to a large mixing bowl and add apples, carrots, cranberries, raisins, almond flour, agave nectar, and olive oil. Mix with hands or mixer. Alternatively transfer all ingredients to a stand mixer and mix well until well combined. 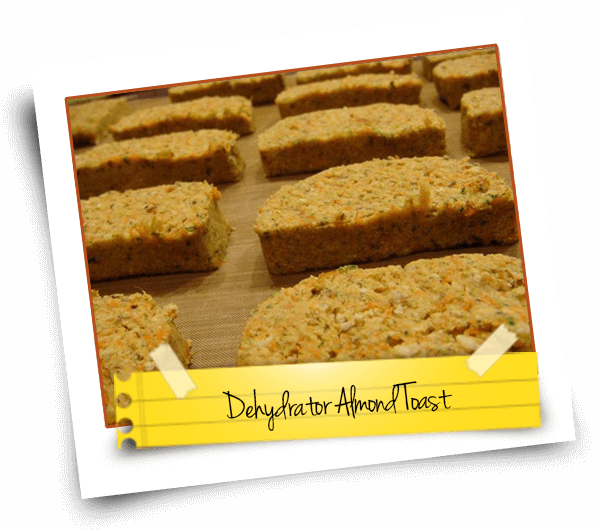 Drop the mixture by spoonful’s onto a teflex dehydrator sheet. If you do not have one of these you can also use parchment paper. Dehydrate the scones at 115 degrees Fahrenheit for 4 hours. Turn the scones over and dehydrate for another 3 hours on the other side. Scones should be completely dry but still soft and moist in the centers. Let cool on wire racks and seal in air tight bags. 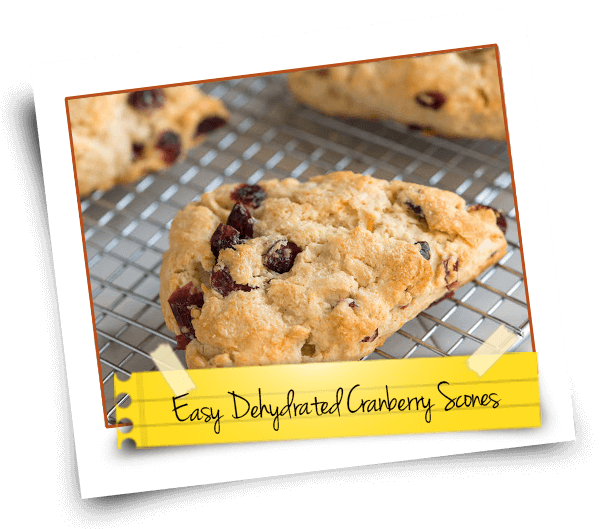 Variations: Make cherry scones by omitting raisins and adding 2 cups of chopped dried cherries. You can also substitute honey or any other sweetener instead of agave next if desired, just make sure to adjust liquid levels as needed to keep the correct consistency. This bread has a wonderful cheesy flavor with a hint of pepper. Cardamom and cayenne add just a hint of spicy that is just a bit different, making these great savory snacks or the perfect base for vegetables and dips. 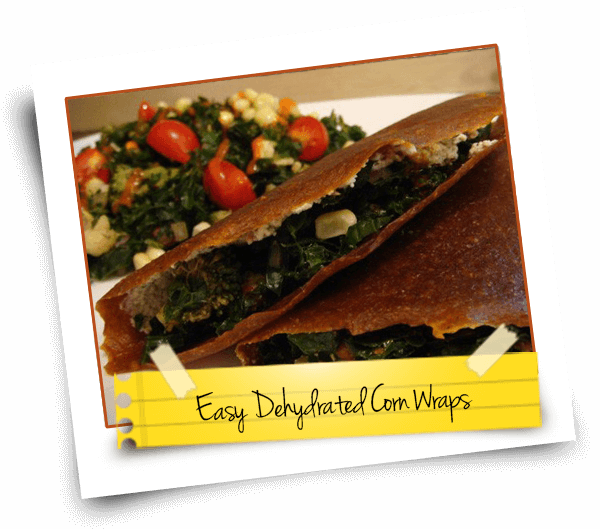 This recipe is suitable for gluten free, grain free, vegan, and raw diets. Instructions:Blend the sunflower seeds in a coffee grinder, food processor, or high speed blender to make flour. Alternatively you can buy sunflower seed flour in some health food stores. Combine all the ingredients with the exception of the water in a food processor or blender and puree until combined. Begin adding water in a thin stream until the mixture is completely combined and has a thick but sticky texture much like wet bread dough. Spoon the mixture out onto a dehydrator sheet and shape however you would like. If you do not have a dehydrator sheet you can use parchment paper. Set dehydrator at 110 degrees Fahrenheit and dry bread for 8 to 12 hours or until the texture is the bread is slightly soft and moist on the inside. Variation: You can also add shredded vegetables to this bread for a bit more flavor and texture. Add up to a quarter cup of shredded carrots or zucchini in with the ingredients and process until combined. 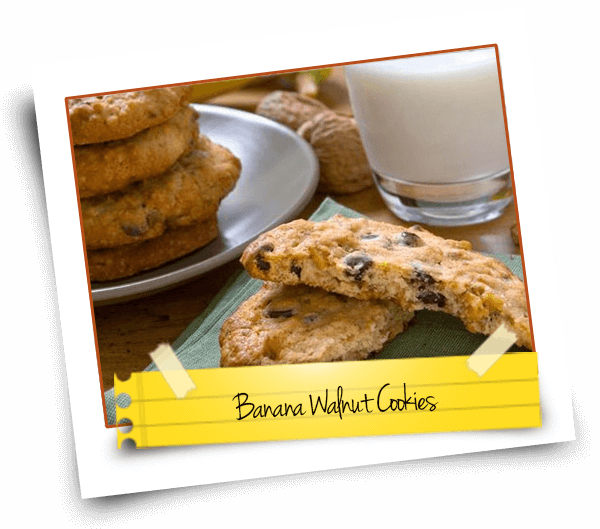 In this recipe only the bananas are dehydrated, and then incorporated into the bars which are not cooked. 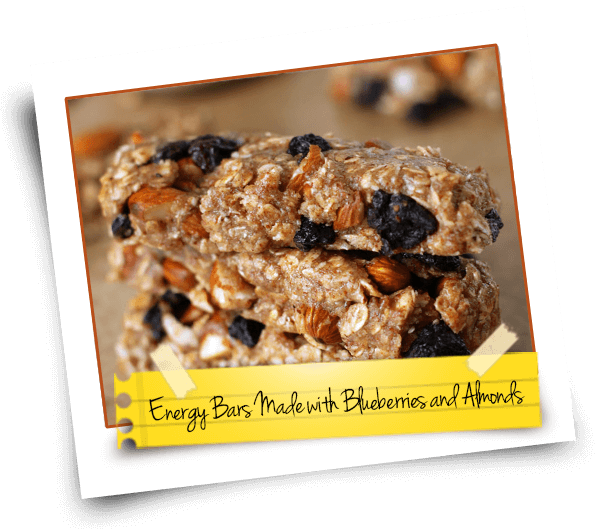 These resemble a Lara bar or other type of energy bar, and make a great way to start your morning. Once they are cut, you can wrap them and store them in the refrigerator for a week or freeze them for up to a month. This recipe is suitable for raw, gluten free, and vegan diets. Instructions: Slice bananas to a uniform 1/8 inch thick and dip them in ascorbic acid. Dehydrate 4 to 6 hours at 125 degrees Fahrenheit or until dry but still flexible. Add bananas to a food processor along with pecans, dates, and salt and process until it is smooth. Incorporate oats and the rest of the pecans into the mixture and blend just until combined. Press mixture out onto parchment paper to a thickness of 1/2 inch. Cover with another piece of parchment, and using a rolling pin, roll out the dough until it is 1/4 inch thick. Cut into rectangles and refrigerate. This recipe takes a little bit more time to make, but once completed these bars are a great source of energy. 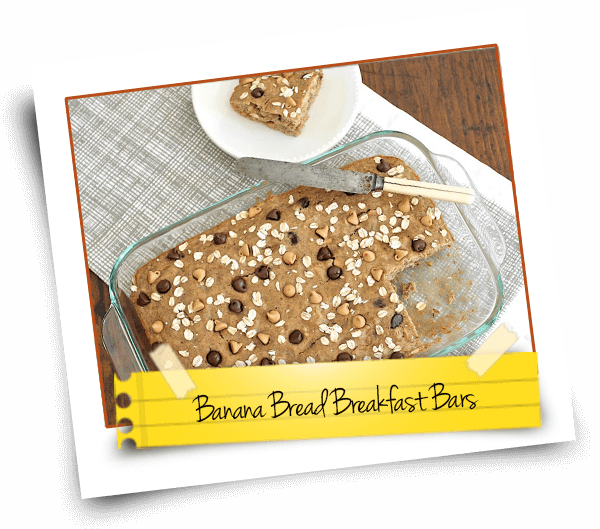 Full of protein, carbs, and healthy fats, they will get you going in the morning and will provide a consistent source of energy throughout the morning and all the way to lunch. 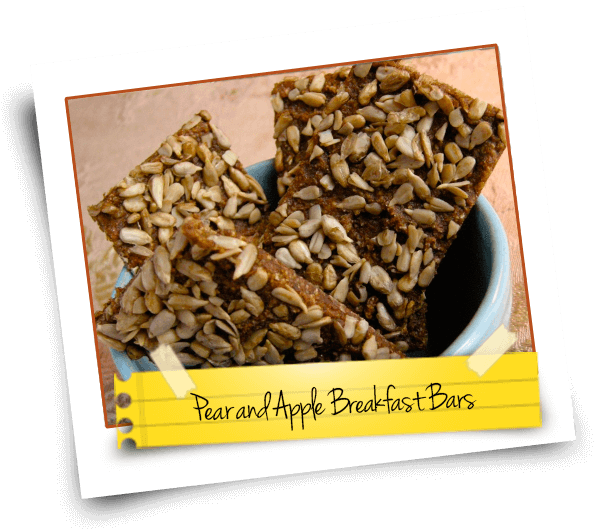 These bars have no sugar or added fat but still have all the sweetness and richness you are looking for in a breakfast bar. Hemp seed is usually found in the health food stores and is a great source of omega fatty acids. Directions:Soak buckwheat groats for 30 minutes. You can use the buckwheat groats as is, or for better taste and nutrition sprout them. They are extremely easy to sprout, and only take 48 hours to do so. Sprout by putting soaked and rinsed groats in a mesh strainer. Leave them in the mesh strainer covered with cheesecloth rinsing and draining them twice a day. Once groats are ready to use, combine them with the hemp seed, cinnamon, allspice, salt, and vanilla in a food processor. Pulse until the dry ingredients are finely ground. Chop pears and apple, and add them to the food processor bowl along with the orange zest, dates, and half the sunflower seeds. Process until smooth scraping bowl as needed. Transfer mixture to a large mixing bowl and add in the chopped walnuts. Spoon mixture onto nonstick sheets for the food dehydrator. If you do not have any teflex sheets you can substitute plastic wrap. Spread the mixture so that it is 1/4 of an inch thick and is in the shape of a rectangle. Sprinkle the remainder of the sunflower seeds on top of the bars. Set the dehydrator at 115 degrees Fahrenheit and run for 10 to 12 hours. Halfway through check the bars, if they have set up, slide them onto a cutting board and cut into rectangles of the desired size. Flip the bars onto the mesh trays without the nonstick sheet and let them continue to dry. Bars should be stiff not flexible when they are done. They will be chewy but should not bend. These bars can be stored for 4 to 5 days on the counter on a plate covered loosely. For longer storage place them in an airtight container and store them in the freezer. Blueberries are not only full of vitamins, they are also packed full of antioxidants. Almonds are considered to be one of the world’s healthiest foods because they help to protect you from diabetes and cardiovascular disease. What could be better for you then creating an energy bar that is packed with both of these amazing ingredients along with a host of other nutritious and delicious ingredients? InstructionsStart by preheating the oven to 275 degrees Fahrenheit. For this recipe you will need a lightly greased 9 inch baking pan. Using a food processor with a good sharp blade, grind the sesame seeds, sunflower seeds, and almonds until they look like a good coarse meal. Add the blueberries and cranberries to a mixing bowl. Pour in the maple syrup and add the nut and seed mixture. Finally add the cinnamon and stir the mixture only until everything is evenly combined. Wet your hands with a little water and then gently mold the mixture into the baking dish prepared earlier. Take your time to make sure the molded mixture is evenly distributed in the pan for the best results. Place the pan in the preheated oven and bake for approximately one hour or until lightly toasted in appearance. Allow to cool completely before removing from the baking pan. Remove from the pan and cut into 16 evenly sized bars. You can store your blueberry-almond bars for up to one week in an airtight container. 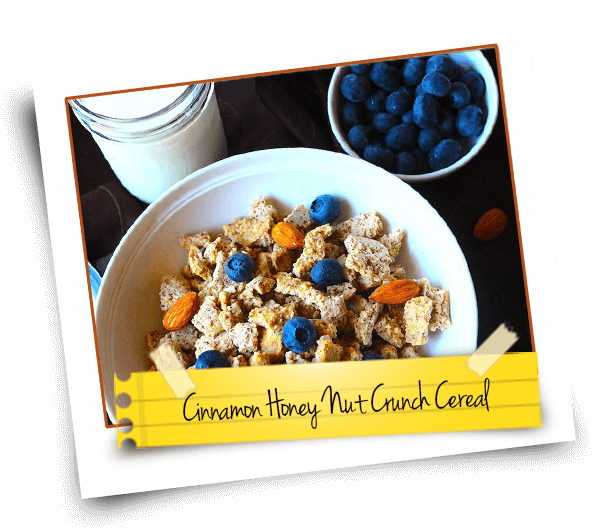 This recipe more like a traditional cereal than granola, and makes a great snack food as well as breakfast cereal. Add dried fruits or nuts to give it a few more flavors. This recipe is grain free and suitable for the paleo diet or you can add oats or granola to it to give it a bit more bulk. If you cannot find pecan flour your can use all almond flour, or grind up soaked pecans in a coffee grinder to make your own flour. Combine flours, baking soda, cinnamon, and salt in a medium size bowl, and whisk them together to combine. Using a smaller bowl whisk together the milk, vanilla and honey until combined.Add the wet ingredients into the dry ingredients and mix well, scraping the side of the bowl and making sure the flours are well combined with the wet ingredients. Let the mixture sit for at least 5 minutes. Stir mixture again and then spoon it out onto silicone mats or fruit roll up trays that came with your dehydrator. If you do not have mats, you can use parchment paper or plastic wrap. Cook the cereal at 165 degrees Fahrenheit in your dehydrator for approximately 10 hours. When the cereal has been in the dehydrator for 5 hours, flip it over, breaking it into pieces if necessary in order to do so. Cereal is done when it is crunchy and has no more damp spots. When the cereal is done cooking, allow it to cool until it is no longer warm. Break into smaller pieces by hand or place it in a bag and used a rolling pin to break it down into bite size pieces. Store cereal in an airtight container in a cool dry place. Dried potatoes are seen in a lot of processed food products on your supermarket shelves. Lots of people wonder if they can duplicate these themselves and the answer is yes you can! 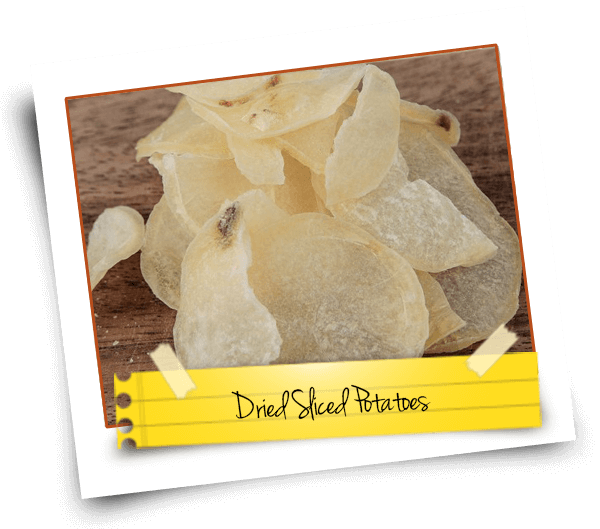 Dehydrating potatoes can extend their storage time and makes a great addition to soups, casseroles, and other dishes. They are easy to store, simply put them in an air tight container and store them in a cool dry place and they will last for 6 months to a year. Instructions:Peel potatoes if desired, and slice into 1/8 inch thick rounds. Make sure to cut into uniform slices, this is best done using a mandolin, but can be done by hand if you do not have one. While cutting potatoes, fill a large pot with salted water and bring to a rolling boil. Dip potato slices in the water using a metal colander, deep frying basket, or blanching basket. Once the water comes back to a boil, leave potatoes in the water for 8 minutes to blanch. Fill a clean sink with ice water and plunge potatoes in the ice water once they are done blanching. This stops the cooking and ensures that the potatoes do not overcook. Once the potatoes have completely cooled spread them on paper towels to allow them to dry. Add more ice to the sink as needed to ensure the water stays cold while blanching the remainder of the potatoes. Spread potato slices out on racks that have been sprayed with vegetable oil, or use the plastic protector sheets that come with the dehydrator. Make sure to space potatoes so there is plenty of air circulation between them. Dehydrate at 145 degrees until the potatoes are completely brittle and do not bend or flex at all. Let dried potatoes cool completely and pack in in air tight glass jars and vacuum seal bags for up to a year. Rehydrate by placing in a bowl and covering with warm water for 15 to 20 minutes or you can simply add to your favorite dishes. Be sure to add extra water as the potatoes will soak up a lot of the liquid in whatever recipe you add them to. Dehydrating all of your own spices and herbs not only saves you money but the finished product is fresh and has so much more flavor than what you can buy in the store. Minced and powdered garlic is very easy to make and this method can just as easily be used for minced and powdered onion, green pepper, and celery. It is best to start out with aged garlic, you will know it is ready when it gives off a strong odor. Instructions:Separate the cloves in each head of garlic, cut each end of the clove with a knife and peel garlic cloves. To make it easier to peel garlic microwave cloves for approximately 8 seconds. You can also place garlic on your cutting board and smash it with the broad side of your knife. This will break the garlic down and make it easier to peel. Place peeled cloves in a colander and rinse them well. 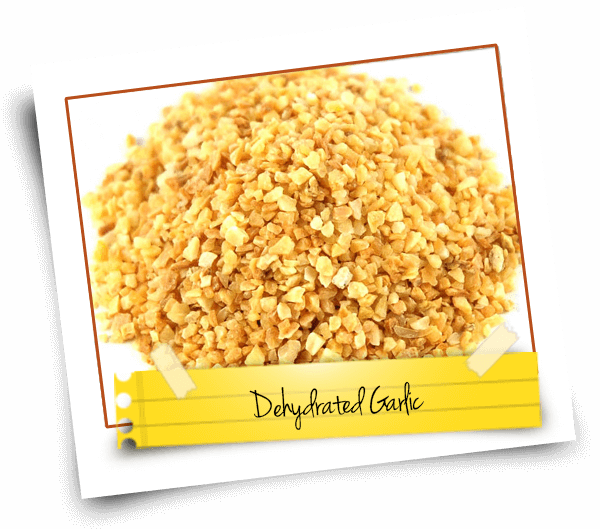 Place garlic cloves into a food processor a few at a time and pulse carefully until the garlic is chopped. Do not mince too finely as dehydrated product will shrink. Load the chopped garlic onto trays spreading thinly. Set temperature on dehydrator to 125 degrees Fahrenheit and dry for 8 to 12 hours or until all moisture is gone. Seal garlic in an air tight bag or jar as is, or process in a food processor to make garlic powder. If your food processor does not completely powder the garlic you can either use a coffee grinder, or a mortar and pestle to grind it the remainder of the way. A high powered blender is another option for powdering the garlic. 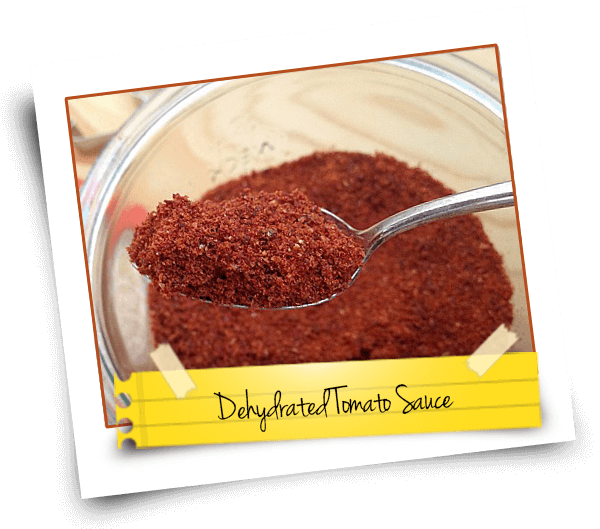 This recipe has hundreds of possibilities and differs slightly from the tomato powder recipe both in the types of sauce you use, as well as what you can use it for. This recipe is great for quick easy one pot meals and is great for food storage. Use up extra vegetables in your garden and make a great sauce for all of your pasta dish needs. You can either start with your own homemade tomato based sauce or you can buy sauces in the store. Make a marinara with all of the vegetables and spices you would normally use. This is what you will be dehydrating. Instructions: Prepare your sauce the way you normally would. This will be the base for all of your sauces so anything you will put in this sauce will be powdered. You can also add other dehydrated vegetables to the resulting powder later if you want. Once the sauce is made and has cooled, pour it onto nonstick teflex sheets or fruit roll up sheets, you can also pour it onto plastic wrap or parchment paper. Spread the sauce fairly thinly, you should put no more than 8 fluid ounces on an Excalibur dehydrator tray, less on the small round dehydrator trays. Spread sauce out uniformly to the edges of the sheet. Dry sauce at 135 degrees Fahrenheit for 6 to 8 hours or until the tomatoes are leathery and dry to the touch not sticky. Flip the sheet at 5 hours to speed up the process. Once the leather is completely dry you can either powder it in a food processor or blender or you can leave it in pieces, they both work equally well. Store in an air tight container for up to a year. To rehydrate combine it with equal parts hot water and let sit until it has completely dissolved. This powder adds a ton of flavor to foods and can be transformed into an instant vegetable soup base or used as a seasoning for other foods. 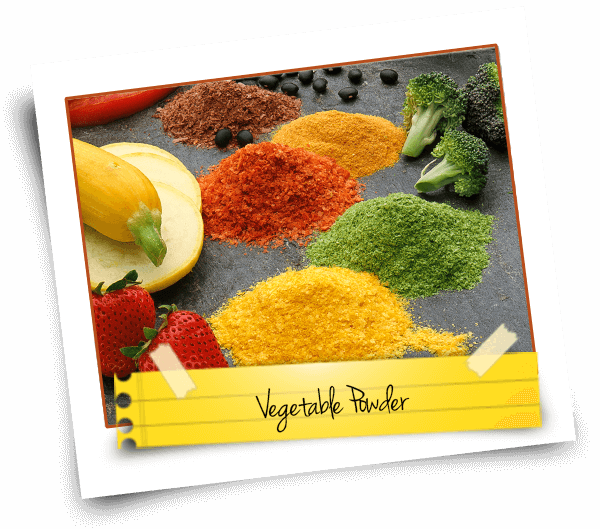 You can create just the vegetable powder itself or you can also add spices such as garlic and rosemary to it to create a salt free seasoning or powdered soup stock. Instructions:In this recipe all of the above ingredients are dried first. They are then combined in a food processor, or a coffee or spice grinder and ground to a powder. You can also add any of your favorite spices to this mix. Pepper, rosemary, thyme, and sage are just a few of the spices that would make this a great seasoning and soup base. Store the powder in a mason jar or other air tight container. 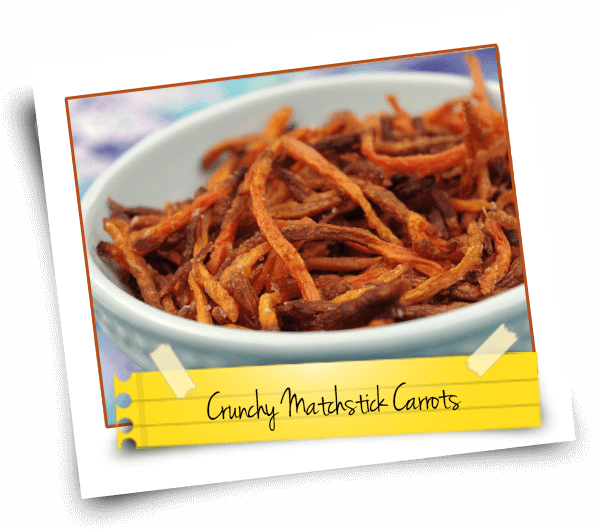 Carrot straws are a great way to get your family eating more vegetables. 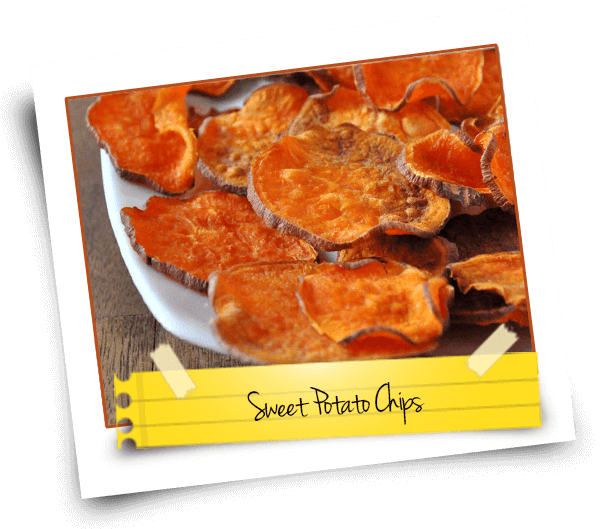 These crunchy treats are slightly sweet and salt and make a great alternative to eating chips. Add as much or as little salt as you want, or add other seasonings to get great new flavor combinations. These are gluten and wheat free and low carb making them a perfect snack for most diets. To save time purchase carrots that are already matchsticked and ready to go. Instructions:If using regular carrots, cut into the smallest match sticks possible. This recipe works best if the carrot pieces are as small as possible. Toss matchsticks in oil and salt until thoroughly coated and let drain slightly. Place matchsticks on dehydrator trays in a single layer and not touching. If you have teflex sheets or fruit roll up trays you may wish to use them to prevent the oil from damaging your trays. Set dehydrator at 145 degrees and dehydrate for approximately 8 hours. Check frequently for desired dryness. For crisp matchsticks, bend a stick, if it bends easily they are not ready. For best results sticks should be completely dry and crispy. Smoked salmon is a favorite for the holidays, but if you don’t have a smoker, and would love to make something similar, salmon jerky is easy to make and makes a great change from the usual beef jerky. 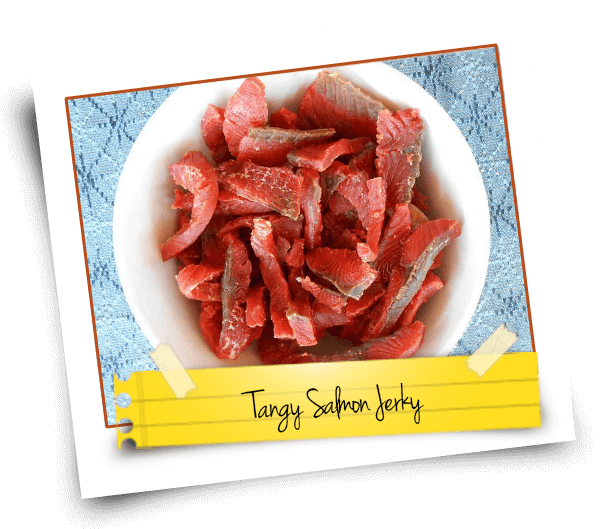 This recipe produces a tangy jerky that is reminiscent of the tangy baked salmon you might make for dinner. If you would prefer a smoky salmon there is a variation for that as well. This salmon jerky can be eaten as a snack alone or can be crumbled over a salad or mixed into a dip for a great flavor change. Instructions:Freeze salmon until it is slightly firm but not solid. This makes it easier to get uniform thin slices. Carefully peel the skin off the salmon by pushing the knife against the skin. Cut salmon into 1/4 inch thick slices. Add all ingredients to a deep mixing bowl and whisk until completely combined. Add salmon slices ensuring that the marinade covers the salmon, cover and put in the refrigerator for at least 12 hours. Remove salmon from refrigerator and place pieces on paper towel to drain off excess marinade. Place salmon in the dehydrator and set temperature to 145 degrees Fahrenheit. Dehydrate for 3 to 4 hours or until it is a dark red brown color. The jerky should be dry but slightly flexible and chewy, not crunchy. Store jerky in an air tight container in the fridge or freezer. Variations: If you prefer a smoky salmon, omit cider vinegar and lemon juice and add 1/2 cup Worcestershire sauce and 1 1/2 teaspoons liquid smoke instead. You can also make a teriyaki salmon jerky by substituting 1/2 cup teriyaki sauce and 1/2 cup soy sauce for the vinegar and lemon juice. Beef jerky is great to take camping or hiking or just makes a good high protein snack for anytime. Beef can be expensive, even some of the cheaper cuts, so a good option is to make your jerky from ground meat. The other advantage of ground meat is the ability to work more flavor into your jerky and having a jerky that is not difficult to chew as some cuts of meat can be. 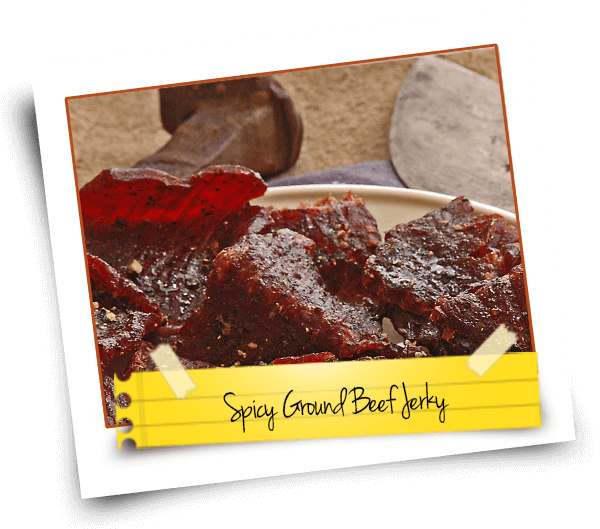 Ground beef jerky is also easy to make because it does not require a meat slicer as other cuts of meat do. All you will need is a jerky press or gun which can be obtained anywhere where dehydrators are sold. Directions:Place hamburger in a large mixing bowl and combined with all of the dry ingredients. With your hands mix hamburger and spices until the spices have been thoroughly worked through the meat and are evenly distributed. Press meat with jerky press or gun, and lay them out on wax paper, parchment paper or plastic wrap. Whisk liquid smoke, ketchup, and Worcestershire sauce together in a small shallow bowl. Lay strips in bowl to coat, turning to coat both sides. Place strips on dehydrator trays and allow to air dry. Dehydrate strips at 155 degrees for 8 to 10 hours or until the meat is completely dry and has no moisture. To check and see if the jerky is done bend strips in half. The strips should still be flexible enough to bend without breaking, but should not be soggy and should hold their own shape. Keep jerky in an air tight container, either in the refrigerator or for longer storage in the freezer. Variations: There are a number of different variations for ground beef jerky. Instead of Worcestershire sauce, liquid smoke, and ketchup try a bit of Franks Red Hot sauce, or a mixture of teriyaki sauce and soy sauce. You can also add other spices to the meat such as rubs, onion powder, or steak seasonings. Both a sweet and savory snack, sweet potatoes are full of vitamins and minerals, and are generally considered to be better for you than regular potatoes. The key to a crispy chip is to slice the potato as thinly as possible. A mandolin or meat slicer will give you the best uniformly sliced chips. Soaking the slices before dehydrating them will also affect how crisp your finished product will be. There are several variations is you prefer a flavored chip. Instructions:Peel and slice sweet potatoes. A mandolin is best for slicing, but you can slice by hand provided you are careful to slice them as thinly as possible. Soak slices in a bowl of water for one hour. Change water after the slices have been soaking for 30 minutes. Drain sweet potato slices on paper towels, wiping up any excess moisture. Places slices in a bowl and drizzle with oil. Stir potatoes to coat evenly, add a bit more oil if necessary. Season the slices with the desired amount of salt, depending on how salty you like your chips. Place the sweet potatoes on dehydrator trays, using teflex mats if available. Dehydrate at 145 degrees Fahrenheit for about 12 hours or until the chips are crispy. Check frequently by breaking a small piece of potato, it should not bend but break. Variations: There is no end to the different variations you can try with these chips. For spicy chips add a bit of taco seasoning or chili powder when you salt them. For garden chips sprinkle Mrs. Dash over your chips before you put them in the dehydrator. For a sweet chip omit salt and sprinkle with a bit of cinnamon and sugar. You can also drizzle a small amount of maple syrup on your chips before drying them. These will be a bit sticky when done but are a great treat for the sweet tooth in the house. Cookies are the comfort snack of both the young and old. Your child will love nothing better than to come home to a snack of cookies with a big glass of milk or juice. Most moms want healthy snacks not full of sugar and fat and most cookies cannot offer that reassurance. These cookies will satisfy any ones need for an occasional cookie but are surprisingly healthy. You won’t find sugar or lots of butter or trans fats in these cookies. Instead they are loaded with whole foods you will feel good about giving your child. Instructions:Apricots should be rehydrated with warm water prior to doing this recipe if they are not already soft. Add all fruit to a food processor and pulse until they are finely chopped. Add the nut butter and sea salt and puree until thoroughly mixed. Add the coconut slowly a small amount at a time and run food processor until the dough can be rolled into balls. Adjust the amount of coconut you use to bring the dough to the properly consistency. If the dough gets too dry you can add a bit of water at a time until it is the right consistency. Pinch out walnut sized pieces of dough, and flatten on a dehydrator sheet into a 1/4″ thick disc. Place sheets in the dehydrator and set on 145 degrees. Run dehydrator for 6 hours, cookies should be dry and set but not crumbly. Set out on cooling racks, and seal in airtight containers or bags for longer storage. 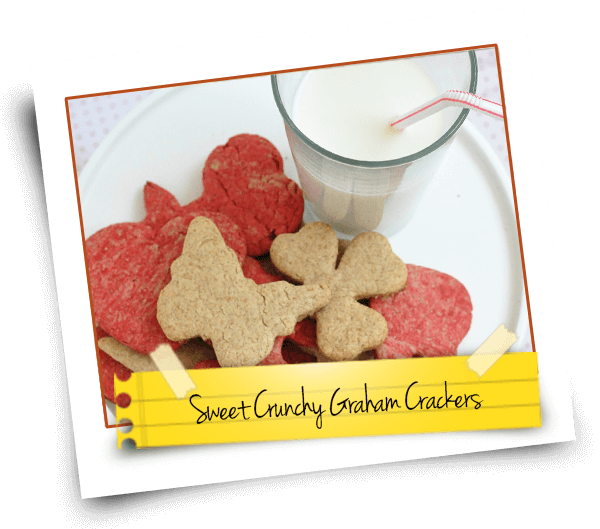 These graham crackers are lightly sweet due to the graham flour and a touch of honey and maple syrup in the recipe. These crackers are dairy and egg free, contain no sugar and are great to use any way you would use store bought graham crackers. Top with a bit of peanut butter and add bananas or raisins on top or a bit of chocolate, and marshmallow to make s’mores. These also make great ice cream sandwiches, simply make them a bit thicker and cut out with a biscuit cutter. 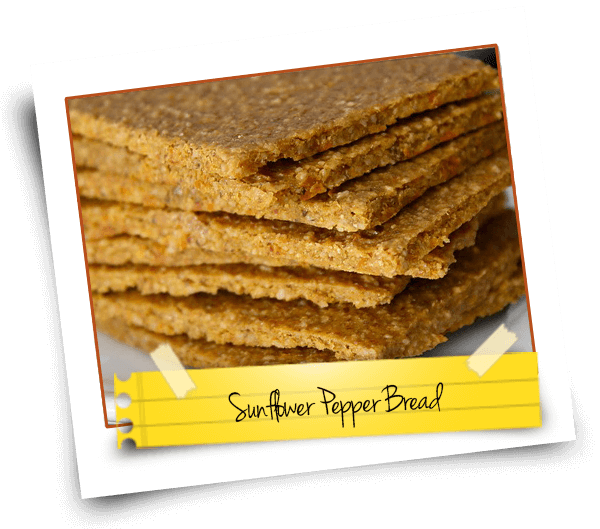 They are a low fat multigrain cracker that has plenty of fiber making a great snack for anyone. Instructions:Soak the buckwheat groats in 1 1/2 cups of water the night before you plan to make the crackers. When you are ready to start your crackers, drain the groats and leave them to drain and dry for a while. Add the oats to the food processor and continue processing until it is all a flour like consistency. Add the rice flour, graham flour, cinnamon, nutmeg, baking soda, and salt and continue processing until all the dry ingredients are thoroughly combined. Add in the maple syrup, honey, and water and process with the pulse setting of your processor until it makes a hard ball of dough. Add more flour as necessary, if the dough is too wet. Divide dough into two balls, and roll out to 1/8″ thick. Cut the crackers into the desired shapes and score each cracker with a fork. Place crackers on teflex sheets or other dehydrator sheets and place in dehydrator. Dry at 150 degrees Fahrenheit for 5 hours. Flip crackers over and dry for another hour. Crackers should be crisp and break easily when they are done. This recipe makes approximately 20 full sized graham crackers. Variations: If you want to make chocolate graham crackers add 1/2 cup of cocoa and increase water to 1/2 cup. If desired you can use all maple syrup or all honey, or substitute any sweetener in equal amounts. If you use sugar or brown sugar increase water by 2 tablespoons. For cinnamon graham crackers sprinkle crackers with cinnamon and sugar after placing crackers on the dehydrator sheets. Graham crackers animals can be made by rolling the dough a bit thicker and cutting crackers into animal shapes with cookie cutters. 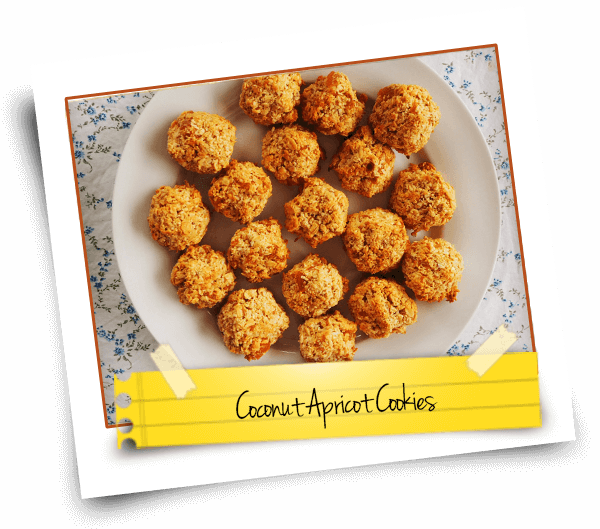 These nutty crunchy cookies can be formed into cookie shapes or can be rolled into small balls and added to cereal, fruit salad and more. They are very simple to make with minimal ingredients and they have no sugar or added fat. Seal these in air tight containers and add to your child’s lunch box. They will never know they are good for them. Instructions: Process 4 tablespoons of the walnuts into a flour like consistency. Add bananas and pulse in a food processor until smooth. Chop and add the remaining walnuts, as well as the raisins, and spices to a medium size mixing bowl with the banana mixture. Mix by hand until all of the ingredients are combined. Spoon dough onto dehydrator sheets or parchment paper and place in the dehydrator. Dry cookies at 125 degrees Fahrenheit for 4 to 6 hours or until cookies dry, do not over dry. This recipe makes 24 cookies. Variations: Almond or pecans can be substituted for walnuts. Add chocolate chips or coconut for a special treat. Dice up apples into small pieces and add to the mixture. Instead of cookies place dough on sheets in small spoonful’s and use like granola for a topping over yogurt, cereal, or fruit. If the mixture is not sweet enough you can add 2 tablespoons of brown sugar. This recipe is filled with a number of super sweet fruits, making it a great alternative for that sweet tooth in the house. There is no need for sugar as the figs, dates and raisins provide all the sweetness. Dates are naturally sticky so they hold these delightful little balls of fruit and nut goodness together. Super simple to make these are perfect for snacks at any time of the day. Instructions:Process dates, figs, apricots, and raisins in a food processor until they are fine bits. Add the fruit to a mixing bowl and add in walnuts and sunflower seeds. Mix well, adding lemon juice in as you mix. 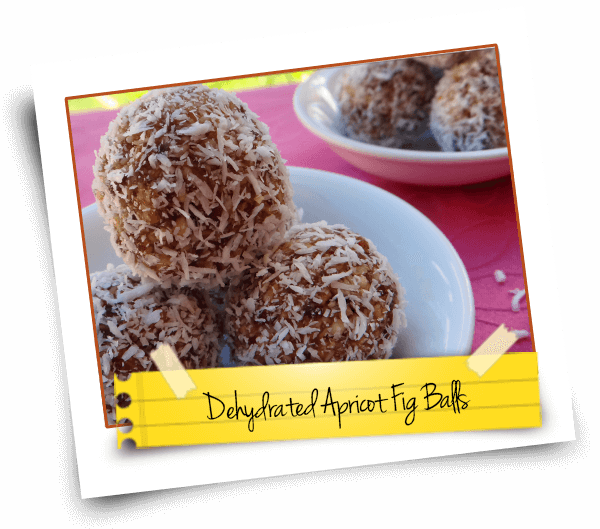 Shape into small balls, approximately 1 inch in diameter and then roll in the coconut. Place on drying trays about an inch apart. Set dehydrator at 135 degrees Fahrenheit and dry for 4-6 hours or until the outsides of the balls are crispy. Variations: Add a 1/2 cup of miniature chocolate chips or old fashioned rolled oats. Add a half teaspoon of almond, vanilla, or chocolate extract when adding the lemon juice. What Is the Best Coffee Maker on the Market? CAN YOU PLEASE SEND IT TO MY EMAIL ADDRESS.